Here is a highlight on MONOCIRCUS' 3D printed Cuff Bangles and Bracelet series. when we are designing our fashion items. Our objective is to create something new, something that will touch hearts. This series of Cuff Bangles and Bracelets shown here comes in a variety of characteristics. Each creates a unique atmosphere. Bangles and Bracelets, as fashion accessories, add distinctive accents to the overall 'look' to an outfit. and draws attention particularly to the hands of the wearer. Here are some of our work that adds a stylish, communicative and aesthetic element to your wrist. a simple yet outstanding bracelet made up of interlocking chain links. it is contemporary yet projects a peculiar antiquity that makes the item extraordinary. with an intriguing ethnic sensibility and antiquity yet contemporary in design. 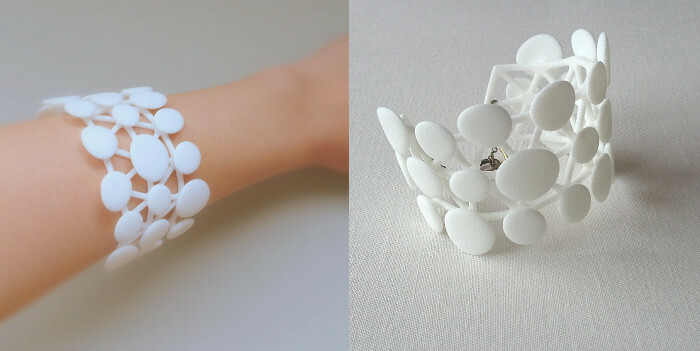 into these stylish lace-like plastic statement-making cuff bangles.